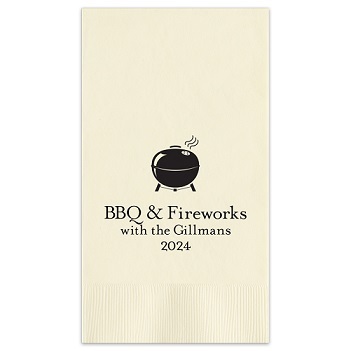 Independence Foil Pressed Guest Towel features many summertime motifs that are perfect for a Father’s Day BBQ. Father’s Day is coming up on Sunday, June 21. Did you know that the first Father’s Day was celebrated in 1910 in Spokane, Washington? And that the holiday became an official U.S. holiday only in 1972? Put in this context, Father’s Day is a relatively recent tradition. Given its place in the calendar, squarely in summertime, it’s only natural that Father’s Day is often celebrated with a backyard BBQ. And that has us licking our lips in anticipation. Whether your dad loves ribs, steaks, brats or tofu burgers, here are some ideas to help you create an extra special Father’s Day BBQ. Cooking Light recipes for Father’s Day We love this menu from Cooking Light magazine. Steak, jalepeno poppers, potatoes and grilled corn. What’s not to love? Is Dad a sports fan? Use his favorite sports or racing team’s colors to be the basis for the floral centerpiece and table cloth. Or maybe he’s a devoted alum of his college or high school; use those colors. For both these ideas, you can use simple white plates and clear glasses, and let the sports or school colors be the accents. Expression Foil Pressed Napkin Proudly display your special message on the Expression Napkins. Names, dates, special occasions or sentiments stand out when pressed in one of 15 gorgeous foil colors on your choice of 27 high quality, three-ply papers. Notable Monogram Oversized Note Our Notable Monogram Note offers a choice of many exclusive monograms. Raised ink. Folded note. Double-thick paper. Choice of white or ivory paper. Comes with 50 Pinnacle pointed-flap envelopes. Opt for the border, 100% cotton paper, hand-inserted lining or return address to create a luxurious gift.